After the previous success of Tomoyuki Hoshino’s short-story collection, We, the Children of Cats (from PM Press), I was eager to try another of the writer’s books. Today’s choice is a novel, which makes a nice contrast, allowing me to see which genre suits him better. So, how does Hoshino fare in the longer form? 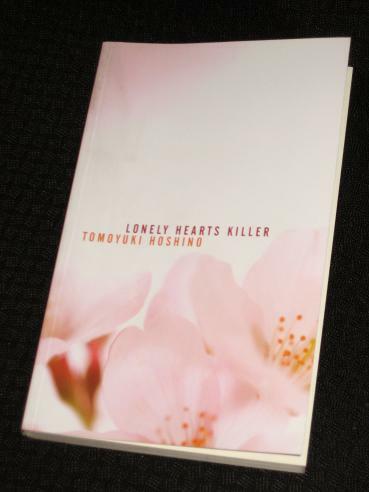 Lonely Hearts Killer (translated by Adrienne Carey Hurley, review copy courtesy of the publisher) is a novel which could almost be called dystopian in a detached, literary way. After the death of the young Emperor (called Majesty throughout the novel), the ‘Island Nation’ nosedives into a communal depression, with many people unable to even get out of bed. While many of those ‘spirited away’ had no strong feelings about the royal family, it seems that the event has acted as a catalyst, causing people all over the country to collapse under the stress of their everyday lives. It’s a frightening story, but one which is eminently believable. A depressing event triggers mass depression and soul-searching in a country which is already in the grip of a downward spiral. With an ageing population and a depressed economy, there is little hope for the future – and in a society where suicide is not as stigmatised as it is in Christian countries, death is always an enticing option. Even the weather joins in, cherry blossoms blasted off the trees by giant dust storms (perhaps symbolic of Hoshino’s rejection of ‘typical’ J-lit conventions), and the reader is treated to the eery sight of Tokyo as a ghost town, with the streets emptied of people. All of a sudden, it seems that nowhere is safe, and no-one can be trusted. Iroha is also obsessed with filming wherever she goes, and it is her film of Miko, films of films, an endless hall of digital mirrors, which causes the initial cracks in Shoji’s facade.